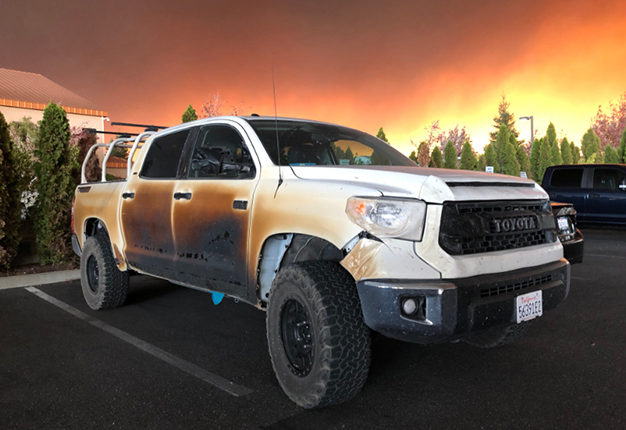 Toyota has offered to replace a brave nurse's bakkie with a brand new one after saving the lives of countless nurses in the deadly California fires. According to Tire Meets Road, Allyn Pierce seriously damaged the outside of his car to help with the quick evacuation of patients. He was also one of the unfortunate residents to lose their homes as flames continue to devastate large parts of California. Images of the bakke show melted rear lights and side-mirrors while the bodywork is charred. Autoblog reports that he thought his life was coming to an end and he recorded a message to his family. A statement from Toyota read: "Our hearts go out to the victims of the devastating California wild fires. We are extremely grateful to all of the emergency crews who are working tirelessly to extinguish the fires and helping people to safety. "We are especially thankful to one hero in particular, Allyn Pierce, for risking his life and sacrificing his Toyota Tundra to drive people to safety. Toyota is so humbled by Mr. Pierce's selfless act that we're pleased to offer him a brand new Tundra." Here's my @toyotausa commercial. This truck literally saved my life today. My little town of Paradise was literally burning down around me and @the_pandra got me to safety where I could help others...twice. #campfire #perfectmarshmellow #meltedplastics #buttecountyfire #sema2019 thanks to the fire fighters, law enforcement and my fellow healthcare workers for the work we all did getting the hospital evacuated and our patients to safety. ?????? The devastating fire in California has so far claimed the lives of 48 people in what so far been described as the worst in the state's history.